The average American listens to the radio three hours a day. In light of recent technological developments such as internet radio, some argue that the medium is facing a crisis, while others claim we are at the dawn of a new radio revolution. The Concise Encyclopedia of American Radio is an essential single-volume reference guide to this vital and evolving medium. It brings together the best and most important entries from the three-volume Museum of Broadcast Communications Encyclopedia of Radio, edited by Christopher Sterling. 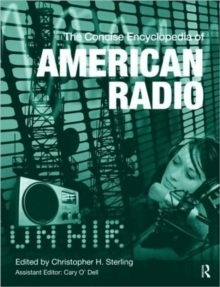 Comprised of more than 300 entries spanning the invention of radio to the Internet, The Concise Encyclopedia of American Radio addresses personalities, music genres, regulations, technology, programming and stations, the "golden age" of radio and other topics relating to radio broadcasting throughout its history. The entries are updated throughout and the volume includes nine new entries on topics ranging from podcasting to the decline of radio. The Concise Encyclopedia of American Radio include suggestions for further reading as complements to most of the articles, biographical details for all person-entries, production credits for programs, and a comprehensive index.